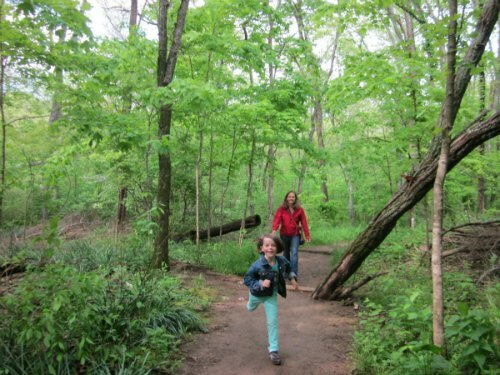 As 21st century parents, we are constantly competing with technology for our children’s attention and getting our families outside for outdoor family activities can be a struggle. Between iPads, Facebook, Xbox and YouTube, you can almost go an entire summer without interacting with your child–except to nag them to do their chores. 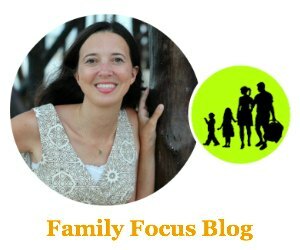 Although this makes for cheap babysitting, it’s also a major component in the breakdown of the American family. Time spent together outdoors with your kids is perfect for bonding, exercise and fresh air. But you have to be smart if you are going to compete with technology–because technology is pretty darn stimulating. Here are a few fun ideas for family activities for summer that will get your kiddos off the couch. Park The Car In The Garage: Instead of wasting gas this summer how about pulling out the bikes, skateboards and scooters and riding to breakfast, the park or beach? This will save you money and give you a chance to exercise with the family. 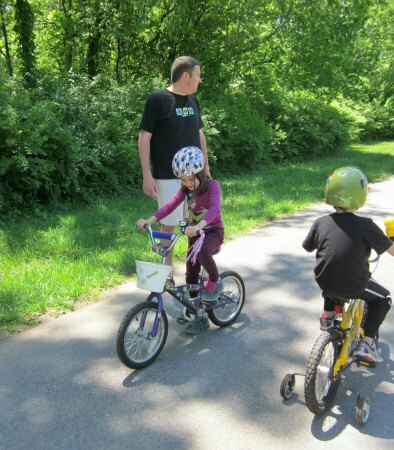 Starting young is a great way to teach kids to ride bikes and to make it a life long habit. Get Your Gardening Gloves Out: This is a fun activity that will also get some chores done. Take the family out to your local gardening center and have each person pick out the flowers, plants or veggies they want for the garden. Then work together at planting and tending to the garden. Bring a radio outside if you want a soundtrack to all that green thumb work. Teaching kids gardening and working in the garden together and watching it grow will be a rewarding experience for everyone involved. This is one of the most educational family activities for summer fun. This may be more fun for families with younger children but even big kids can help facilitate. Pick a place you would like to hike and create a list of things that you will find in nature, including various plants, insects and all sorts of creatures. (That might require some research, creating yet another bonding opportunity!) This will give you the chance to exercise, get some sunshine, and learn a thing or two. Camp In Your Own Backyard: If you have a tent, you have a campground. You don’t have to drive half a day to spend the night in the great outdoors. You can even have a little campfire using a fire pit, sing songs, and roast hot dogs or marshmallows. The great thing about being in your backyard is that you have a clean bathroom just a few steps away and you don’t have to be worried about being eating by bears. Sidewalk Chalk Excursion: Chalk is a fun, colorful and non-permanent way to make the world a prettier place. I love seeing the chalk work of a child; it always brightens my day. Get a box that has a ton of colors and work together to create a masterpiece. You can even think of nice positive messages that people can read when they walk by. Or create your own sidewalk chalk games. Water Balloon Brigade: This is one of the most classic family activities for summer fun. Water balloons are a blast, especially on a hot summer day. You can separate the family in teams, giving each team a specific color balloon. Sometimes it’s fun to dress up in white and fill the balloons with a little food coloring. By the end of the battle, you will all be rainbow warriors. Beach Day: The possibilities for fun are endless along the shore of your local lake, river, or ocean. Pack a lunch and bring any props necessary for an entertaining day at the beach. Mom can relax with a book, or take part in the building of sand castles, interspersed with the occasional dip. Frisbees, footballs, kites and paddleball are also great things to bring with you. By the time you get home, the kids will be too tired to turn on the Xbox! Host a Block BBQ: Not only will you have time outside to bond with your family, you will be giving other families the opportunity to do the same. This is a fun way to get to know your neighbors. You can even theme the party. Luau anyone? (Dad will look great in a grass skirt.) When the whole block is partying, there is no need to worry about playing the music to loud. This is a great way to get to know a few different families, and the longer daylight hours are perfect for BBQs and outdoor feasts, and large games of tag and hide and seek. Backyard Fun: How about taking the kids in the back yard and turning on the sprinklers, you are bound to get some laughs out of the whole family. It is great exercise, fun and doesn’t cost a thing. 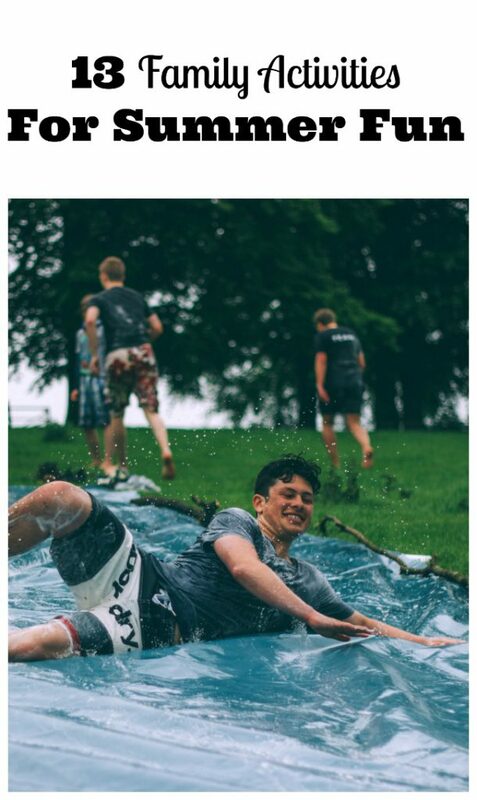 You can also pull out a slip and slide if you have one or have a water gun fight. “When I Was A Kid” Day: Remember the good old days when you were a kid? Let’s get some exercise down memory lane. Show your family the way you use to entertain yourself in the summer time. Kicking the can, a fun game of baseball on an old dirt lot, marbles, bubbles, hula-hoops are all fun ways to get some good old fashion fun. It’s the perfect time to implement some good old-fashioned family time. Go On An Adventure: Try a daily deals site like Groupon that routinely features interesting activities that the whole family can enjoy for a fraction of the cost. What better time to cash in on one of these than this summer? Pick something that you never would have done before, like sailing or rock climbing, and take advantage of the low price for a fun-filled adventure with the family. Designate A Game Night: Pick one night a week that is designated as family game night and then bust out all of the board games. Order pizza and play a few different games throughout the night. Sitting outside around the table as a family playing games will be the perfect chance for everyone to unplug for a few hours. Kids Choose: Each weekend let a different family member choose a family activity to do. You’ll appeal to each person in the family this way and get a chance to spend a day doing what they’re interested in doing, whether it’s going to a water park, attending a baseball game, or playing laser tag. It does take a little more time and energy to spend time with the family–but the alternative is just so sad. A family that spends time together is a family that stays together. You are teaching your children how to be important lessons so that, when they grow up, they too will have healthy bonds with their own families. Get outside and enjoy family activities for summer fun and create lasting memories with your family. Make spending time with your family this summer an important part of each week. By focusing on each person individually and on the family as a whole you’ll all grow closer together, experience new things, and make a slew of new memories. What are your favorite family activities for summer? I pinned this for #10! Great way to get outdoors and share a memory. Handling daily operations can be so time consuming.Taking a break to play outside is so important. We like hiking together as a family.